A few years ago, I went mini matchbook album crazy. I love how easy these are and how just a few scraps can bring an album together. For those not familiar with these cute mini albums, they open just like a book of matches! When you open the mini album, here is the first page. The pages are stapled on the bottem (the orange fall strip covers the staples). This adorable little guy was begging to be used in more than a scrapbook page. I attached him to some canvas thinking he would make a great gift tag, and he did. I have not cute fabric yet with my pazzle, wouldn't this guy look cute done in felt or as a cotton applique? A little Halloween mixed media. I used a 12x12 frame and the 4x4 tiles (that come with it), a 6x6 paper pad, some stamps and paint, some perfect pearls, a bracelet from the halloween isle, my die cut machine, and some webbing. The spooky tree in the upper left corner is a stamp, the lower middle tree is a die cut. I teach a mixed media class and this sample board uses a different technique on every tile. Mini Albums are by far my favorite pieces to create. They are extremly easy, fun, creative and totally addictive. Mini albums can be made with left over scraps, a bit of this and a piece of that. You can coordinate them with a full size album, picture frames and home decor. The possibilites are endless. I like to start with little chipboard albums that I can usually find in the dollar section at Target or Michaels. The chipboard is thick and it makes a sturdy base. Then there are times when my recycling bin is overflowing, and I'll drag out a few cereal or cracker boxes to cut down to size. One of my favorite classes to teach at Michaels is our Paper Bag Mini Album which is put together using brown (or white) paper lunch bags. Shown here is a back to school paper bag mini album. The calendar says spring is almost here however, Mother Nature isn’t so sure. While the rest of the country is having record high temperatures, here in the Pacific Northwest snow is blowing all around. When the snow melts tonight, the rain/cold move in. The perfect time for some paper crafting.. I love the dollar section of most stores, especially Michaels. I picked up about 10 of these mini chipboard albums when they were 70% off. I knew how cute they could be. These are 4×6 chipboard albums with jump rings to bind them. I love this paper and embelllishments. I love the ducks, they remind me of spring. And the colores are so vibrent. The inside pages are just about the cutest farm animals I’ve seen. Don’t you agree? The great thing about this paper bag mini album is the use of one 6x6 paper pack. The paper was so pretty and detailed the only embellishment I put on was a single shimmer flower on the front cover. The use of ribbons is a fantasic way to cover the jump rings I used to hold the album together. When you fold the bags pockets are created. 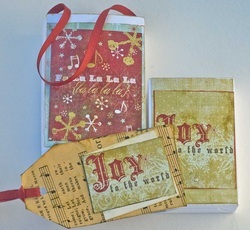 Most I will glue closed, I left one open and created a pull out tag to hold those precious holiday journal entries. I could have declared Sunday "Official Rosett Day". Yesterday, while hosting my Michaels Crop, I made 10 paper rosetts to use on my display board. Michaels offers a fun paper education class called Paper Party. I’m doing my samples for a new baby themed party. Boxes of all shapes and sizes. These simple square boxes are made from a 6" square sheet of cardstock and a 6.25" piece of matching cardtock. As long as you start with a square shape you can create any size box. Simply add a quarter inch for a snug fitting lid. Next time you need gift boxes for party favors, small gifts, trinket holders, piece of small candy, really any reason, a simple folding technique will yield beautiful results. Custom gift tags are so easy to create and so fun to give. Years ago I taught a bags and tags class through our local community center. The bottom tag uses an old piece of sheet music.